February has been a very productive month for the foundation. We hosted a booth at the Pond Hockey Classic and the Great Meredith Rotary Fishing Derby. We also purchased the hovercraft and held a dedication ceremony with the Moultonborugh Fire and Rescue team. The Air Rider AR-45 SAR hovercraft was purchased from Gordon Bay Marine in Seguin, Ontario. The manufacturing time was about 8 weeks. Gordon Bay was great to work with, they answered all of our questions and made the process easy. I had the chance to learn a lot about hovercrafts and shipping things internationally. A small crew from Moultonborough Fire and Rescue drove to Gordon Bay Marine for hovercraft training. They spent a day learning about the vehicle, the mechanics, and driving it. The team is committed to becoming experts and they have already mastered so much in such a short time. February 9, 2019, a group of family, friends gathered at the Moultonborough Public Safety Building for a dedication ceremony. The hovercraft shined with the morning light, hitting it’s bright red color. Everyone had a chance to go inside of the hovercraft and experience this powerful machine. 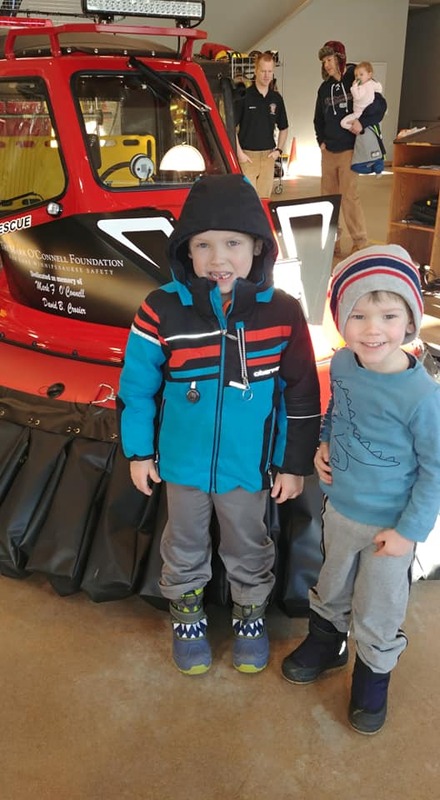 A few speeches were shared and the hovercraft was officially handed over to the town of Moultonborough, dedicated in memory of Dave Crosier and Mark O’Connell. Moulotnborough Fire and Rescue has been taking the hovercraft out to other towns on the lake for training. They are also attending other public events to educate the public. They have been an incredible partner to us throughout this process and we are so grateful for this partnership. A hovercraft provides the capability for emergency rescue teams to safely meet the extreme transitional surface challenges of land, water and ice. It gives emergency rescue crews the ability to reach victims in an emergency situation regardless of their location and the conditions of the lake and terrain. Lake Winnipesaukee currently does not have a hovercraft available. There is a single airboat located in Tuftonborough. The addition of a single hovercraft is paramount to improve the ability to rescue victims. So why don’t all rescue teams have access to these important safety vehicles? It's simply a limitation in access to resources. These rescue boats are expensive and also require personnel training to ensure safe handling. Through the work of our foundation, we will provide Moultonborough with an Air Rider Hovercraft AR45 Search and Rescue vehicle. This will also include staff training directly with the manufacturers in Ontario, Canada. This effort could not be done without the cooperation of the Moultonborough Fire Chief and his staff. The hovercraft will be maintained and managed by the Moultonborough Fire Rescue, but it will be a vital resource to all of the towns surrounding the lake. The Fire Rescue teams coordinate rescue resources across all 8 towns. Want to know how the Fire Department plans to manage this important asset? Read the Q&A with Fire Chief Bengtson below. Question: Where will the hovercraft be stored? Answer: There are two fire stations, one at 948 Moultonboro Neck Road (next to JoJo’s Country Store) and the Public Safety Building located at 1035 Whittier Highway. It could be housed at either station, but it will most likely go to the Moultonboro Neck Road station as that sits it the in middle of the Lake Winnipesaukee area of town. Question: When will the hovercraft be deployed? Answer: It would be deployed for any ice/water rescue incident that Moultonborough is dispatched to or requested mutual aid for. When it becomes available as a resource, we would notify each fire department of a community (Alton, Gilford, Laconia, Meredith, Center Harbor, Tuftonboro, Wolfeboro) on Lake Winnipesaukee that the hovercraft is available to respond to any emergency on the Lake. It would be then up to that community to add it to their response cards or special request it. As members of the Lakes Region Mutual Fire Aid system, the hovercraft would be listed in the LRMFA resource list and could be made available to any one of the 38 member communities upon request as well as to NH Fish & Game and NH Marine Patrol. Question: Who gets to make the call to deploy the hovercraft? Answer: In Moultonborough, any fire department personnel can deploy any resource or apparatus of the department based upon the incident type or mutual aid request. Question: During large event days, such as the Meredith Rotary Fishing Derby or The Pond Hockey Classic, will there be a plan to have the hovercraft out and on the ice proactively? If so, where will it be? patrolling? Answer: Upon receiving the hovercraft, Moultonborough Fire Rescue would begin making regular patrols (weekly or daily dependent upon weather conditions) of the response areas on Lake Winnipesaukee to check ice conditions. This would serve two purposes, one to become better familiarized with the craft and secondly, and most importantly, to identify hazard areas of open water and thin ice conditions. For events like pond hockey, which are out of town, we would make it available and coordinate with the fire department there to fit their operational plans. For the ice fishing derby, it would be best to coordinate with NH Fish & Game and the other Winnipesaukee community fire departments on a resource deployment plan based upon the hazards known and placing the hovercraft in an area where it could be deployed quickly to address those hazards. It has been just about one year since we launched the Foundation! So what have we accomplished in 1 year and what do we plan to do next? Let me tell you! Received Celebrate Everything photos from all over the country and the world! We've reached as far as Australia and New Zealand! Keep the photos coming! We are waiting on our application to be approved to make us an official non-profit! We will certainly be celebrating when this comes through for us, and it will kick off the big push we need to continue fundraising. We hope to make our first purchase! We worked with the town of Moultonorough to pick out a hover craft. The goal is to raise $85,000 to buy the boat and trailer. We are hosting the first ever MFO Golf Tournament on June 20, 2019 at Highfields in Grafton, Massachusetts. A formal save the date is coming soon! Thanks for all the love and support from all of you! We are thrilled that not only is this foundation helping to save lives but it has also become a campaign to live life to the fullest. We love the spirit that all of you have given to this foundation and can't wait to see it spread! One of the great events on Lake Winnipesaukee is Laconia Motorcycle Week, also known as Bike Week. Bike Week is a motorcycle rally held annually in June in Laconia, New Hampshire. It started back in June 1916 and at the time only lasted a couple of days. People came from across the country to participate in festivities. Events included races, shows and a motorcycle hill climb competition. As it became more of a tourist attraction the few days turned into a now nine-day event. After some motorcycle gang and police activity in the 1960’s, strict rules were implemented which decreased Bike Week’s popularity. It wasn’t until the early 1990’s, when the local community formed the Laconia Motorcycle Rally and Race Association and now the nine-day event continues to be a huge attraction and busy time on Lake Winnipesaukee. We'll be there! Look for pictures on our Facebook page during the event. Here are a few safety tips for motorcycle riding. Our "Celebrate Everything" shirt campaign was a huge success for the foundation. Thank you to the many friends and family who purchased shirts and wear them proudly. We love receiving pictures of you in your shirts, so please keep them coming! Thanks to your support, we raised over $4,000 towards our winter rescue vehicle.